We are a small boutique practice located in San Diego North County. We specialize in Cosmetics and Dermatology. We are looking for a permanent part-time Medical Assistant to help with clinical patient care. This position is part time permanent. Monday – Thursday 9:00 am to 4:00 pm. We are flexible with the schedule to accomodate your work / life balance. We are located in Encinitas. We see 12 – 15 patients per day so we have plenty to time to provide the best possible individualized patient care. Medical Assistant with 2 or more years of recent work experience as a Medical Assistant in a private practice or clinic. We would prefer some experience in cosmetics and dermatology. The rate of pay is $18.00 – 20.00 hr. 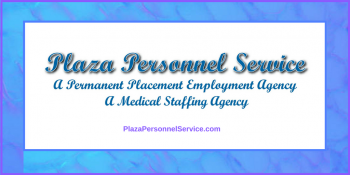 For other opportunities offered by Plaza Personnel Service as well as articles of interest please visit our blog at Plaza Personnel Service Blog and check back from time to time.